Recently, the launch of apple iPhone 6 has made headlines in the tech industry. 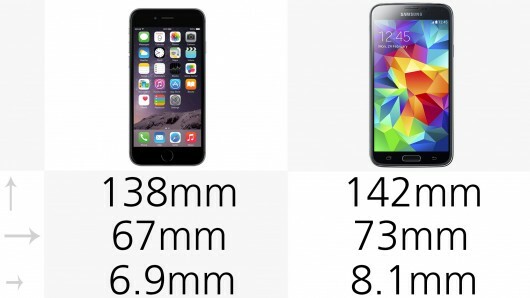 The new iPhone model is bigger, faster and thinner, when compared with its predecessors. Here, we are giving a review of major differences and similarities between iPhone 6 and Samsung Galaxy S5. Both of them are the latest flagship smartphones from two of the biggest smartphone trend setter companies. 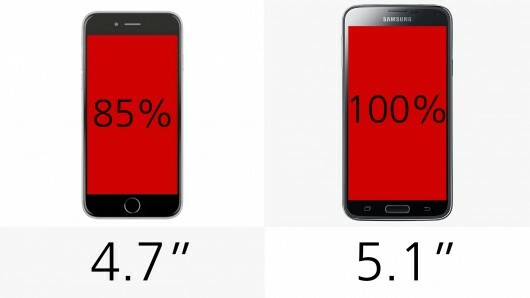 Weight : iPhone 6 is 11% lighter that S5. 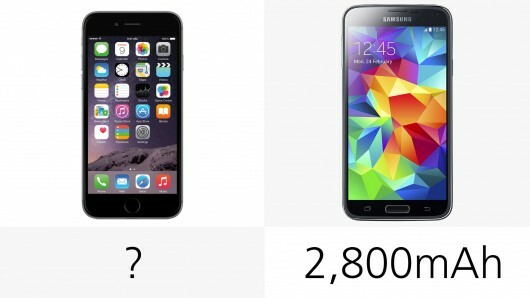 iPhone 6 weighs 129g as compared to Galaxy S5 weight of 145g. 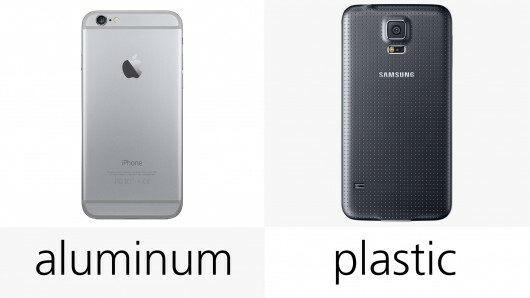 Build : The body of iPhone 6 is made of Aluminium while Galaxy S5’s body is made up of plastic. Screen Size: iPhone 6 comes with a screen size of 4.7 inches while S5 has about 18% bigger screen size i.e., 5.1 inches. 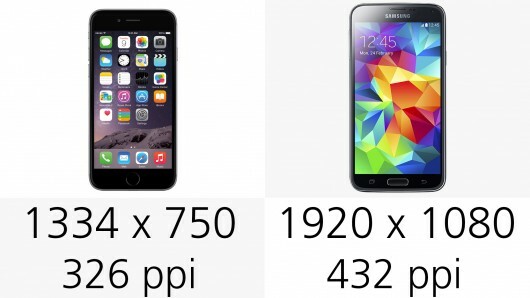 Display Resolution: In this metric S5 is a winner with a screen resolution of 432ppi (1920 x 1080), as compared to 326ppi (1334 x 750) resolution of iPhone 6. Display Screen: iPhone 6 has an IPS display while S5 has a Super Amoled display screen. Battery: Battery: Samsung S5 has a battery rating of 2800mAh. Battery ratings for iPhone 6 have not been released yet but google has promised to give tough competition to S5. Fingerprint sensor: iPhone 6 has a touch ID system while S5 screen is equipped with swipe fingerprint sensor. NFC: Built in NFC has been introduced in iPhone 6. While samsung smartphones already come with this technology for last many years. Ultra Power Saving Mode: S5 has a clear edge in this regard with its Ultra Power Saving Mode, the 10% remaining battery can last for upto 24hrs. Water Resistance: Apple has not revealed anything about water resistant capabilities of iPhone 6. What we know about S5 is that it has terrific water resistance capabilites. It can stay in water at a dept of 3.3ft without any problem for half an hour. 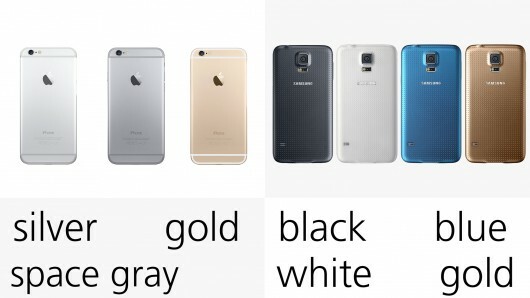 Camera Resolution: S5 has a higher rear camera resolution of 16MP when compared to 8MP for iPhone6. As far as front camera is concerned, still S5 camera has a resolution of 2MP as compared to 1.2 MP of iPhone 6. High Quality Video Recording: Both phones can record HD video with the same resolution of 1080p, and at the rate of 60fps. Slow-Motion video recording: S5 can record slow-motion video with a resolution of 720 at 120 fps. iPhone 6 can record the same resolution video at 240 fps. Storage: iPhone 6 is available in maximum storage model of 128 GB as compared to maximum 32GB model of S5. MicroSD cards: The memory of S5 can be enhanced using MicroSD cards while iPhone 6 does not has this feature. Processor: iPhone 6 uses a 64-bit processer but its specs have not been made public. While S5 comes with a 32 bit, quad core, 2.5 Ghz snapdragon 801 processor. RAM: iPhone 6 has a 2GB RAM, while RAM specs for iPhone 6 are still unclear. Split-screen multitasking: Samsung is the pioneer in using the split-screen multitasking feature which is not present in any other device. Heart Beat sensor: S5 comes with sensor to measure the heart rate while iPhone 6 does not has this feature. IR remote control: S5 is unique as it is equipped with IR remote control for satellite boxes or TV. 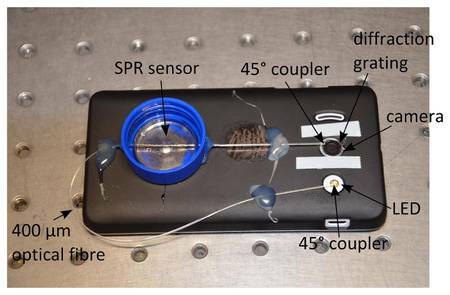 Atmospheric pressure measurement: iPhone 6 as well as S5 both are equipped with Barometer for atmospheric pressure measurement. Operating System: iPhone 6 runs iOS 8 while S5 has Android 4.4 Kit Kat operating system. Price: Both phones have same off-contract price of $650 and on-contract price starting from $200.